Peptide (C)HLVEVVPNGDLVRRD, corresponding to amino acid residues 201-215 of rat CALCR (Accession P32214). Homology Mouse – identical; human – 14/15 amino acid residues identical. 1,2. Anti-Calcitonin Receptor (extracellular) Antibody (#ACR-053), (1:200). 3,4. Anti-Calcitonin Receptor (extracellular) Antibody, preincubated with the control antigen. Cell surface detection of CALCR in intact living rat pheochromocytoma (PC12) cells. 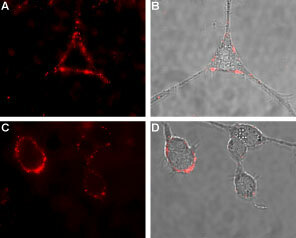 A, C. Extracellular staining of cells using Anti-Calcitonin Receptor (extracellular) Antibody, (#ACR-053), (1:50). B, D. Merged images of A and C, each with its respective live view of the cells. Segovia-Silvestre, T. et al. (2011) BMC Res. Notes 4, 407. Barwell, J. et al. (2012) Br. J. Pharmacol. 166, 51. Taboulet, J. et al. (1998) Hum. Mol. Genet. 7, 2129. Gorn, A.H. et al. (1995) J. Clin. Invest. 95, 2680. Gorn, A.H. et al. (1992) J. Clin. Invest. 90, 1726. Gooi, J.H. et al. (2014) J. Endocrinol. 221, 181.
the calcitonin receptor (CTR) is a class B G-protein coupled receptor (GPCR) that signals via activation of cAMP and protein kinase C (PKC). It is one of 15 human class B GPCRs1,2. Apart from CTR, calcitonin receptor-like receptor (CTLR) is the only other B-class GPCR to bind calcitonin. To date, there are three known human CTR mRNA isoforms arising from alternative splicing3. Calcitonin itself is a peptide hormone that contributes to bone calcification by direct inhibition of osteoclasts which resorb the bony tissue. It is part of a six-member family that has varied functionalities. By binding to receptor activity modifying proteins (RAMPs), CTR and CTLR can form receptors to every member of the calcitonin family. For instance, RAMP1 and CTR construct the calcitonin gene-related peptide (CGRP) receptor. Both CTR and CTLR have seven transmembrane domains, an intracellular C-terminal, and an extracellular N-terminal. To activate the receptors, their N-terminal must first capture the C-terminal of the ligand and then carried to the transmembrane loops where it bestows a conformational change upon them. Besides the bone, CTR has prominent roles in the kidney, CNS, placenta, ovaries, sperm, lung, and in the brain4,5. In osteoclasts, the expression of CTRs declines with age. Interestingly, polymorphism of the CTR gene is strongly associated with decreased fracture-risk in post-menopausal women3,6. Alomone Labs is pleased to offer a highly specific antibody directed against an epitope of rat CT-R. Anti-Calcitonin Receptor Antibody (#ACR-053) can be used in western blot and live cell imaging applications. It has been designed to recognize CT-R from human, rat and mouse samples.